In theaters: There are several things BlacKkKlansman does well; being subtle isn't one of them. Indeed, you get hit with so much ugly racism (is there any other kind?) that I decided Spike Lee wanted white audiences to get a taste of what black people go through consistently. You think this was hard to take? Imagine living it. A real-life blaxploitation story, undercover cop Ron Stallworth (John David Washington) manages to infiltrate the KKK (with the help of the always dependable Adam Driver), which leads to much absurdity. Racism IS absurd, and at no point does the film not think that, but because it's as real today as it was in the early 70s, it's not an absurdity you want to laugh at. 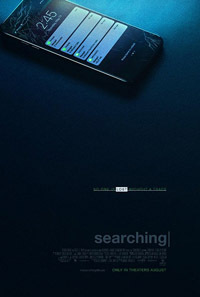 Strong performances and atmosphere, and certainly a film for out times, but the lack of subtlety does give me pause. Not to say Lee's other films aren't rife with racially charged content - that's very much his thing - but shout outs to the future (our present) are way too on the nose, and the final moments are exploitative in a way that's effective, but still had me wondering if he was trying to shout to the people way in the back who still hadn't gotten it. I don't want to use the word propaganda, because I believe in the film's message, but it is certainly in service of that message more than anything else. And yet, there are real moments of self-awareness too, which is where the film's subtleties may be hidden. Eighth Grade is a touching and raw portrait of what it is to be an unpopular 13-year-old, with Elsie Fisher grabbing us right from the opening scene where she manages to visibly become embarrassed and blush while making a video for YouTube and powering through it. That's Kayla in a nutshell. A brave front cracking under the pressure of social ostracisation. Director Bo Burnham has teens play teens, which is of value unto itself, but writes them - if he writes them at all - the way teenagers actually sound. The expressionism, he keeps for time lapses where Kayla falls into her online universe, or for the adults who are all irredeemably uncool and awkward, the way 8th-graders would see them. I felt most for her dad, an understated but committed performance by Josh Hamilton, genuine in his inability to feel offended by the embarrassment he causes Kayla. We play witness to a transition point, as Middle School ends and High School is on the horizon, and I think Kayla's arc works even in the short week and change presented, because there are believable events that help shape her world view. A beautiful slice of life, that makes you want to ask Burnham if he'd consider reuniting with Fisher for Twelfth Grade in four years. At home: Before Casablanca, there was To Have and Have Not, a similar plot in which Humphrey Bogart stymies Nazis in a French colony while also falling in love in an exotic hotel with a featured piano player. Just trade Morocco for Martinique. But while Casablanca is the better film, this has its share of memorable moments, including the "You know how to whistle" scene and plot aside, this it's Lauren Bacall's first movie and she IMMEDIATELY tears up the screen and emerges as a star. Like, wow. What smoky confidence. She's incredible as a mysterious rogue, and a great match for Bogie's hard-as-nails boat captain desperate to stay afloat in a world that's getting politically dangerous. Beautifully lit too, you can tell Howard Hawks is at the controls. "I don't like melodrama", Lauren Bacall says a couple times in her second film, Confidential Agent, as if tempting fate. Indeed this thriller has many melodramatic elements. It stars Charles Boyer as a Spanish agent in Britain on a secret mission during the Spanish Civil War, Bacall is a standoffish woman who gets embroiled in his affairs by accident, though unlike her previous film's performance, the character is rather humorless. 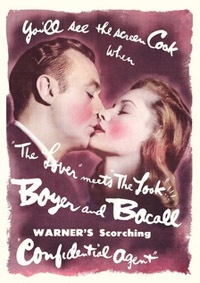 And while that lack of humor works for Boyer, a man in desperate straits, it robs their romance of any real spark. As a spy thriller, there are a lot of twists and turns, but unfortunately, the stakes aren't spelled out at all well until very nearly the end, and I found my attention wandering through most of the first and second acts. Ultimately, there is a lot of incident in this one, but it doesn't hold together particularly well. 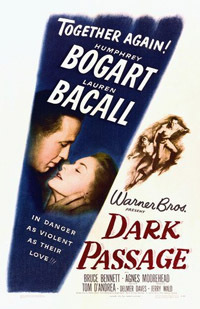 Dark Passage and Lady in the Lake came out the same year, and both have a first person POV gimmick. Thing is, while Dark Passage doesn't sustain it for the entire film, there's a REASON for it, the effect is achieved more cleverly, and with all due respect to Audrey Totter, Lauren Bacall can better carry a film where she interacts with the camera. 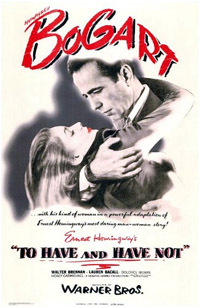 But mostly, it's one of several tricks to keep us from seeing Bogart's face in the first half of the film, even though you can't mistake him - he has one of the most distinctive voices in cinema - and it is justified by its plot about a falsely accused man escaping prison to prove his innocence and getting help from a woman tangentially involved in his history. The twists and turns evoke lurid pulp, and as with many Bogie & Bacall collaborations, the bonkers plot takes a back seat to onscreen chemistry. 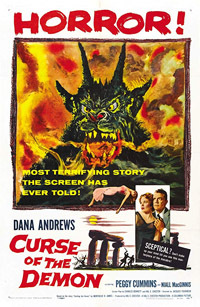 Is it true that the British version of Curse of the Demon, NIGHT of the Demon, doesn't show the animatronic demon? I don't know how I feel about that. Sure, it's a little silly (though when it goes to town, it's VIOLENT! ), but it was part of the charm for me. Though perhaps "charm" isn't what you want from a horror movie. Regardless, if you don't have the demon, I'm sure you're complaining about the plush leopard attack. For 1957, I still think Jacques Tourneur turned in a pretty cool flick, with neat effects (the atmospheric disturbance that heralds the demon's appearance was repeated in Deep Space Nine 35 years later, so I'd say it's cutting edge), strange shots, and a ripping yarn about an unbelieving psychologist coming across what appears to be real, no bunk, supernatural events and having to face off against a warlock who's passing death runes around. Nobody told me this was a Dr. Thirteen movie! There's a way to interpret this movie so that the hero's right, but it's not that ambiguous. Even he's nudged a bit to the believer's side, but only a bit. Psychosomatic or real, the means of murder in this film, and how the hero gets out of it, is my favorite thing about it. The Guns of Navarone is one of those WWII impossible mission movies that were popular in the 60s (is it the granddaddy of them all?). In the film, Gregory Peck leads a small group to a Greek island occupied by the Nazis to destroy massive guns that are keeping a rescue force from getting 2000 men out of the area. Almost immediately, things start to go wrong leading to some pleasant improvisations, hard choices, loss of life, and eventual Allied triumph. It's all pretty well done, though I don't think it gets any better than their arrival on the island in the middle of a storm. That's a LOT of water being dumped on the actors! But one thing about the era's film making that never works for me is day-for-night, and there's a lot of it. It just looks ghastly and never fails to kill my interest. Ultimately, Guns is an adventurous flick with a good cast, but the formula was bettered by several films by the early 70s. 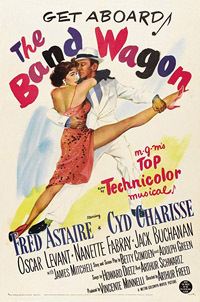 There's something autobiographical about The Band Wagon, in which Fred Astaire is painted as a has-been tapping around in old-fashioned entertainments and being told he needs to reinvent himself. Was he feeling this in 1953 at the age of 54? If so, this flighty musical is a statement. It denies the need for reinvention and affirms the relevance of the kind of song and dance shows he does best. In the story, he is roped into doing a Broadway show with a maverick director who proceeds to change everything so it will become an "important" work, a premise that provides a lot of funny comedy, especially if you know theater people. We're told the original script of the show had "just enough plot" to hang musical numbers on, and folks, that's exactly how The Band Wagon works. At times, it feels like a collection of musical numbers the production wanted to do, plot be damned, but see, it gave itself permission to do that, so you can't get too frustrated. It's all worth it anyway for that expressionistic musical film noir number (the one that inspired Michael Jackson's Smooth Criminal video), which is incredible. And look, Cyd Charisse is in this and I'm not made of wood. I don't think there's a more precise and beautiful dancer in all of cinema. 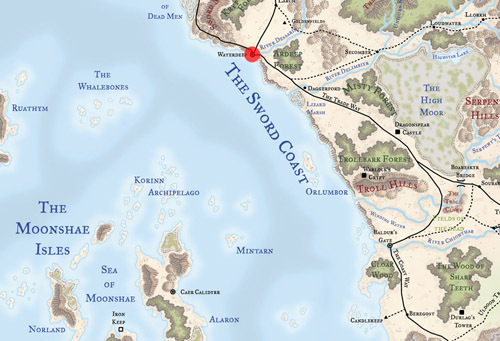 Role-playing: Our BARD&D took off this week, with an arc I'm calling their Western Tour. Action starts in Waterdeep (as per map above), the Big City, at a pretty good inn actually, at least until the patrons and staff start dropping dead during The Tragically Imps' first song. It almost seemed like the lead singer's fault for rolling two critical failures on Singing/Musical Instrument, but no, it was more about a mass poisoning the band had to deal with. While the lead was crit-failing, the beauteous melodica player was crit-succeeding all over the place (what was wrong with the dice?! ), so the culprits, members of a rather large king rat, confided in her. Unfortunately, before she could pull a Pier Piper on the collectively smart vermin, the drummer went berzerker on their squirming asses and then the guitarist did a flaming riff that burned the pantry down. The patrons who hadn't eaten as quickly were saved by a curative song, and the band nevertheless ended up with a strong half-orc following (I've decided to make this race the metal heads of the Forgotten Realms). A bit of fun to ease ourselves into the world and mechanics, though admittedly on the short side as a result. Set list - Start Me Up (The Rolling Stones), How to Save a Life (The Fray), Devoured by Vermin (Cannibal Corpse), King Rat (Modest Mouse), Bitten to Death by Rats (Jame Kochalka Superstar). Well, it wouldn't be D&D without a tavern (or part of one) getting burnt down. You probably mentioned this before, but which edition are you using? The Forgotten Realms setting makes me think it might be 5th, but I know you're an "old school" guy, so I just wondered. The only edition I still have in my collection is 2nd, and it's the one with the Complete Bard Handbook, but I do simplify the rules quite a bit to get to the story. I'm not at all "old school" (I'm one of those filthy narrativists), I just have a lot of older RPG books. I've been in fights with grognards. I mean, I do curate Doctor Who RPG sourcebooks. In this case, it's AD&D 2nd, but I sort of kind of use DrWho's initiative system, Story Points (showing my work next Monday, in fact), Mana instead of spell slots, access to Savage World's Adventure Deck, and I don't want to fuss with Encumbrance, Weapon Speeds, or even traditional XP (characters advance by 1000 points per game and leave me alone). A LOT of leeway is given to give this game a "rock band of adventures" (Tenacious D?) tone.